Custom sail graphics aren’t just for sponsored racers; anyone—racer, cruiser or in-between—can have their favorite graphic or team logo put onto their sails, and it’s a whole lot less expensive than you realize. The Quantum service team dives into the options and what you need to know to make your sail your own. 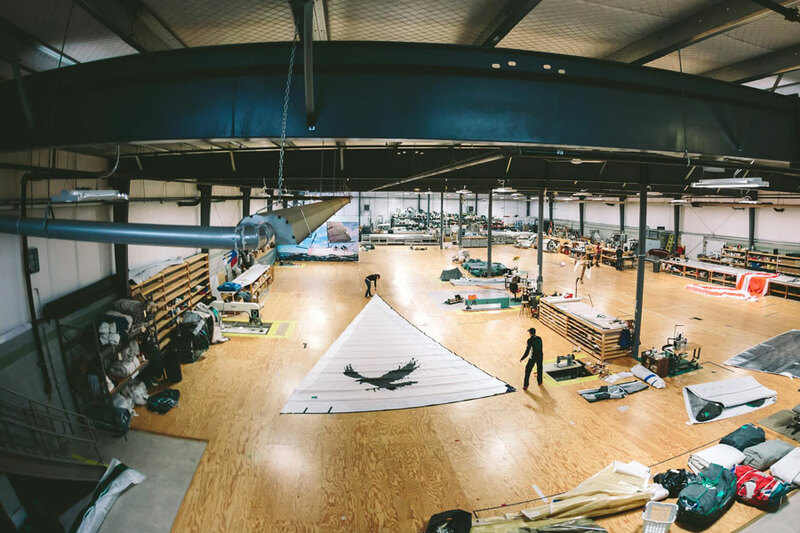 The Raven - The Quantum team preps a new headsail with an awesome ink splot raven in Traverse City, MI. As beautiful as a full set of crisp white sails are, there is something to be said for the added color and fun a cool graphic can add. With a number of different techniques, there are a lot of cool things you can do to your sail to help you make your sails your own. Generally sail graphics are more popular with racing teams putting their team name or sponsor logos on their sails. But today, it’s easy for anyone to get a custom graphic, whether it’s a family insignia, a team logo, or a cool graphic to go with your boat name. It’s a common misconception that the cost of a custom graphic is way out of reach of most boat owners, but depending on the artwork and method of application, it can actually be quite reasonable. 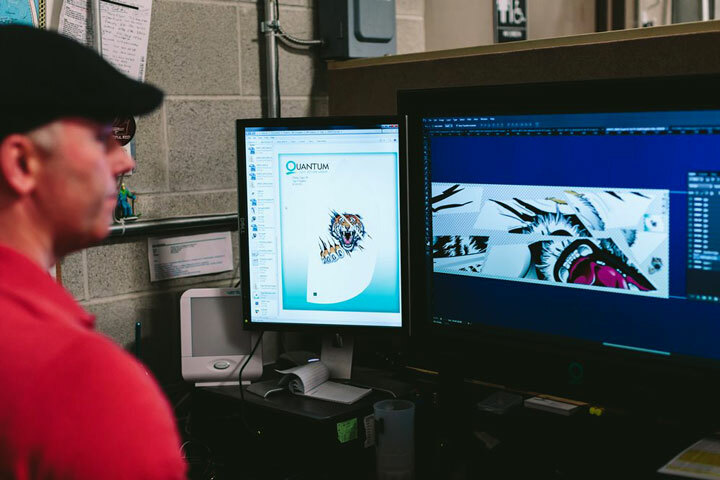 What really drives the price of a custom graphic is size, complexity, and the number of colors—the more colors and the more complex, the more expensive a graphic will be. All about design - Graphics Manager Sean McDowell preps the graphic for Mark Kennedy's Flying Tiger 10M spinnaker. There are four primary techniques of application that vary in price and practicality depending on what kind of sail material the graphic is being applied on; not every application technique is good for every material. 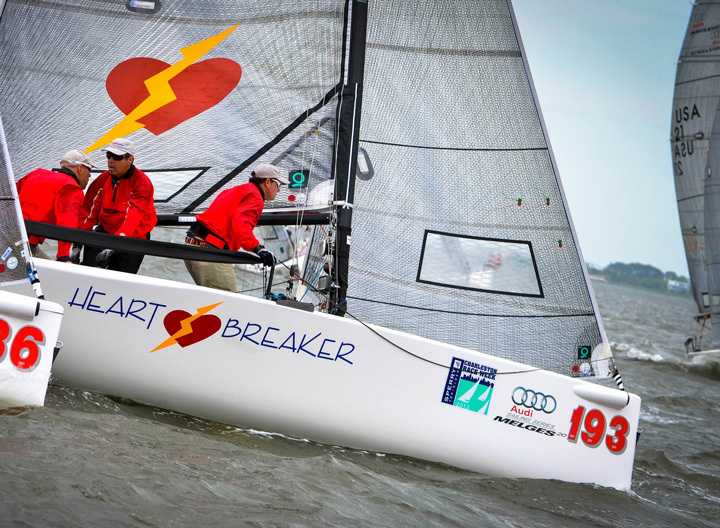 Beautiful enough to break hearts - Melges 20 Heart Breaker sails at the 2015 Sperry Charleston Race Week with an inked broken heart on their mainsail. Photo by Sara Proctor. Inking is the most common method of applying a graphic because it’s the most cost efficient, it can be used on just about any fabric, and if weight is an issue, it’s one of the lightest. The process is similar to screen printing and is best for simple graphics on light-colored sails, either upwind Dacron sails or white nylon spinnakers. On a working sail, the logo would be applied to both sides of the sail, while on a spinnaker the inked logo is typically only applied to one side. 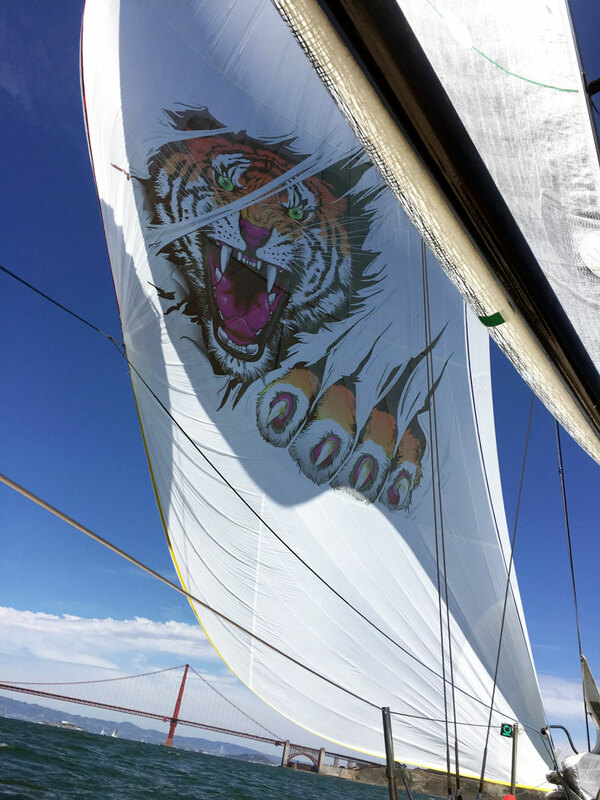 Flying fierce - Mark Kennedy's dye sublimated roaring tiger spinnaker flies in San Francisco Bay aboard his Flying Tiger 10 M Cento Miglia. For really intricate logos, for example the roaring tiger on the spinnaker of Mark Kennedy’s Flying Tiger 10M Cento Miglia, dye sublimation is used. The logo is mapped out onto the panels of the spinnaker—this process is best for nylon—and printed onto a roll of fabric. The panels are then cut out and reassembled as the spinnaker. This process allows intricate graphics with a large number of colors to be faithfully reproduced. “We’ve done some really beautiful projects over the years. The Swan 80 Selene was one of our first major dye sublimation projects. It turned out really well, and since then we’ve done several other sails for the customer,” said Graphics Manager Sean McDowell. Staying cool - a printed vinyl graphic is installed on a mainsail in Traverse City, MI. Graphics can also be printed on sticky-back vinyl and applied to the sail as a sticker. This is most commonly used on upwind sails, and is particularly effective on darker membrane sails. It’s particularly good for simple shapes, letters, and numbers. 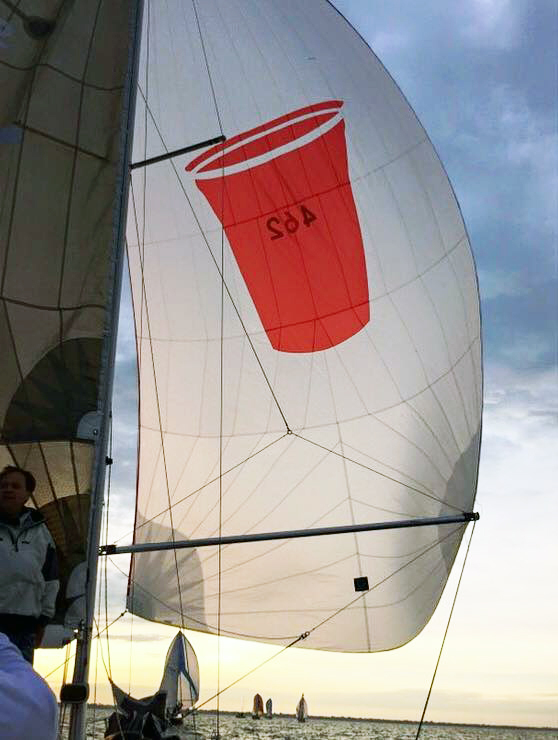 The wind will fill 'er up - An inlaid red Solo cup decorates this spinnaker making it unmistakable and unique. This isn’t the most common method, but it is the most dramatic and longest-lasting application technique for a spinnaker. Pieces of fabric in contrasting colors are sewn into the sail, whether it’s black on red or white on blue, and the logo can be seen from both sides. The panels are carefully laid in along the same thread pattern as the original cloth so as not to affect the integrity of the sail. This process is also good for simpler logos in just a few colors. If you have artwork available, adding a graphic to your sail is a relatively simple process. 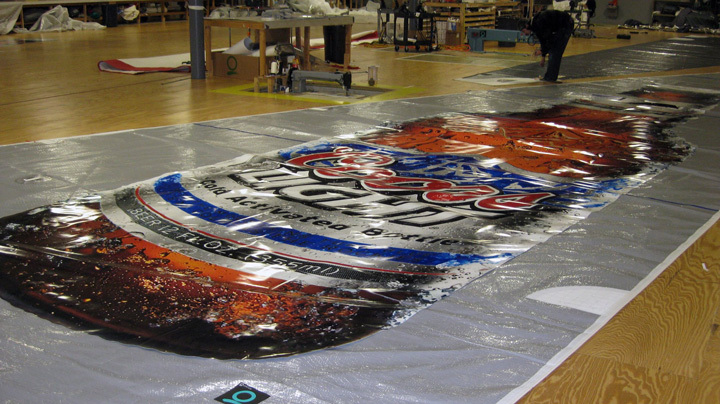 If you have an idea or an image, Quantum can help you turn it into a graphic appropriate for application on a sail. Quisiera una cotización de velas personalizadas.